MONROE — While Keith Cartwright was working in his shop Oct.10, 2015, he didn’t expect what his ham radio received — a call for help. An amateur radio operator had broadcast the SOS, which had been transmitted through the Monroe Peak repeater, which in turn had picked up the signal from the Skyline Radio Club system. However, when he reached his radio, no one had responded, so he broadcasted a message back. Cartwright acknowledged receipt of the mayday, and asked how he could help. “It surprised me,” Cartwright said. On the other end of the broadcast was a man, Andrew Burger, who was transmitting from the Ashley Twin Lakes area near Vernal. Burger was with a possible heart attack victim, Gene Bigelow. “I didn’t even know where that was,” Cartwright said. Burger and his friend Brandon Smith had completed a ham radio operator’s course at Brigham Young University earlier in the year, and happened to have their radios with them. Cartwright was able to get Burger’s GPS coordinates and forward them to dispatchers in Richfield, who in turn connected him to 911 operators in Vernal. Cartwright said he listened to radio traffic and could tell that Bigelow had been transported off of the mountain in a helicopter. At the time, that was the end of the story for Cartwright. He wrote down the experience for the local ham radio club, but was left wondering what the outcome of the SOS call had been. After a few months, Cartwright picked up the scrap of paper he had written Burger’s call sign on and contacted him. Then in April, Cartwright received a letter from Burger. “I’m a solid believer in the relevancy and usefulness of ham radio,” Burger said in his letter. He said the remote area where they were hunting had no cellphone service and if they had relied on cells, there would have been no way of getting Bigelow help. Berger and Smith had been elk hunting when they had a flat tire. A group of ATV riders stopped to help the two men. One of the ATV riders, Bigelow, lost consciousness. Thanks to the relaying of information from northeast Utah, to south central Utah and back again, Bigelow received the medical help he needed. 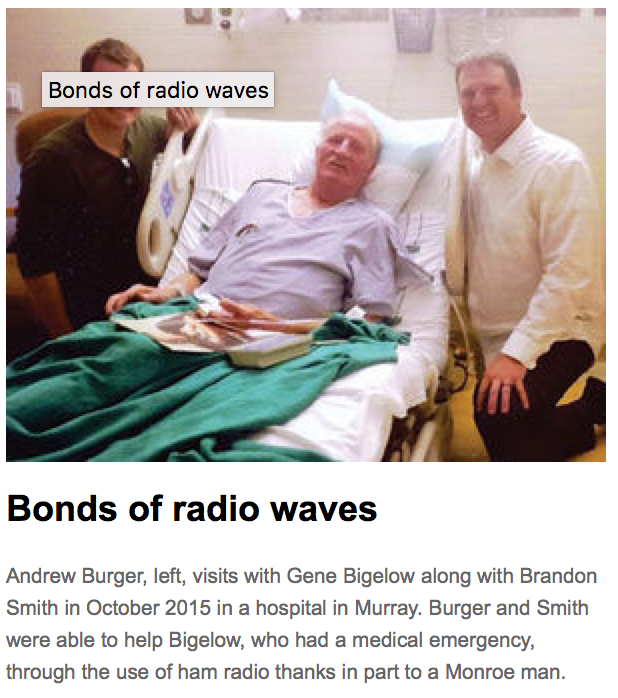 Burger and Smith visited Bigelow at a hospital in Murray in the days following the experience on the mountain. Bigelow was on the mend, and doctors said it wasn’t a heart attack, and that he was expected to make a full recovery. Cartwright said he was happy to get the letter and find out that his efforts from his radio desk were able to help someone in a meaningful way. He said an incident that occurred more than 40 years ago made him a true believer in the power of ham radio. “It saved my life and the lives of two other people,” Cartwright said. He said he and a couple of friends had decided to drive into the mountains near Beaver. “The last thing my dad said to me was, ‘don’t get stuck, that radio doesn’t work,’” Cartwright said. Soon enough, the trio was stuck as a blizzard swarmed and the temperature dropped. His friends implored him to use the radio to call for help. “I wasn’t going to tell them that it didn’t work,” Cartwright said. Faced with the possibility of freezing to death, he tried the radio anyway. Someone picked up the signal. Before long he was talking to his father, who was able to ascertain their location and save them. “That radio didn’t work when we got back into town, but it worked that one time when I needed it,” Cartwright said. Cartwright is part of the Sevier Amateur Radio Club, which has been on air since 2009. The organization generally has between 15 and 30 people check in during the weekly nets, which are roll calls of who is broadcasting and listening. Since its inception, the club has completed 338 of its weekly nets, said Steve Fehlhaber, one of the club’s founders. Fehlhaber said Cartwright’s experience is an example of how amateur radio operators can be useful to emergency responders — especially when traditional means of communication are not available.